Wolf Creek Crafting: Back Up & Running! Hi everyone! It's good to be back. Shortly after my last post, my computer blew up. It's one of the hazards of working online most of the day. My dear techno-savvy hubby has set up my Netbook as a temporary solution, so I can get my work done until I get a replacement PC. I have a lot of things to share with you. I just need some time to get my projects photographed and organized. In the meantime, here's a birthday card I made for my sister-in-law. She likes buffalo (buffaloes?? ), so what image is better than this skating buffalo from the Birthday Bash Cricut Cartridge? I knew as soon as I saw it that it would be on her next card. 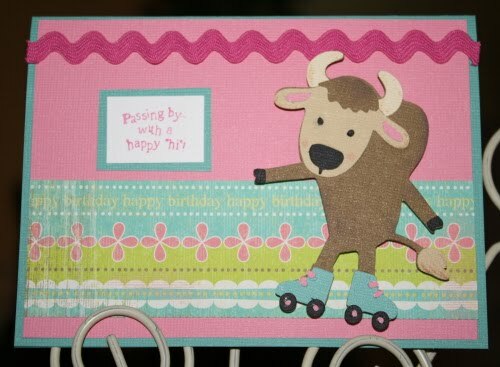 Who would have thought a buffalo could be so cheerful & feminine?? Hey, thanks for sticking with me through my 'puter troubles. I've missed you!